This is a pretty exciting week for space exploration. While the Phoenix lander managed to image a single particle of Martian dust with its atomic force microscope and Hubble had orbited Earth more than 100,000 times, Cassini made a very close flyby of Enceladus, a moon of Saturn. 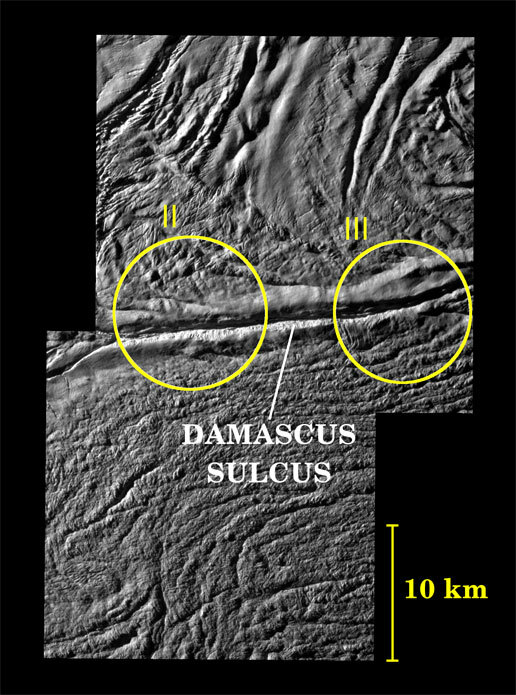 And one of the results from the Enceladus flyby is that Cassini managed to pinpoint the source of the incredible water geysers of Enceladus. They're deep cracks on the surface of the moon with icy debris all round them. I wonder what it would have looked like at ground zero when the geysers erupted? Cassini has started to send back pictures from its close flyby of Enceladus, an icy moon of Saturn. The surface of the moon looks rather wrinkly. Perhaps this is because of all the water volcanos on the planet. It's mind-boggling to think that all of that surface is littered with water ice. Cassini has just made its closest approach to Enceladus according to its tweets. 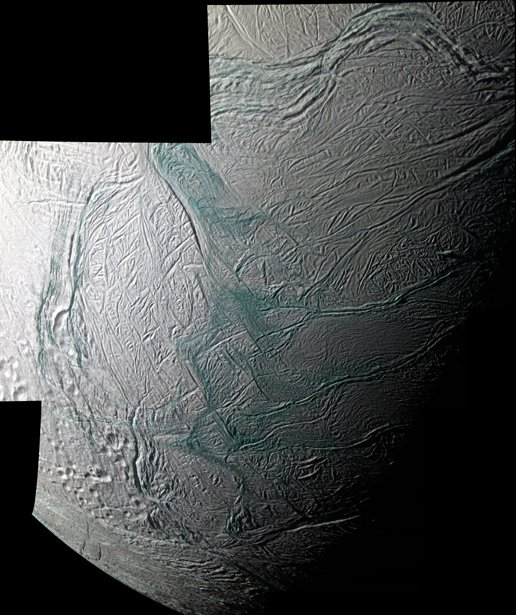 It closed to a distance of 50 kilometers, or 30 miles, from the surface of Enceladus. Cassini still needs to send the data it collected back to Earth, which it should start sending at about 9PM Pacific time today. However, they say some of the best images of Enceladus were taken after Cassini made its closest approach, where it took photographs looking back at the moon as it flew away. These images won't arrive at Earth until tomorrow. NASA has an entire blog dedicated to this single flyby, so head over there to get the nitty gritty details. Scientists have confirmed that liquid lakes exist on Titan, the largest moon of Saturn, using the spectrometer on board the Cassini spacecraft. It's not liquid water, though. It's liquid ethane, a hydrocarbon that probably rains down from the cold skies of Titan. While radar images of the surface of Titan strongly suggested that there were liquid lakes, this is the first time direct observational evidence was gathered. With all the hydrocarbons on Titan, along with all the liquid ethane sloshing around like water, it would be truly extraordinary if there were carbon-based life forms which use liquid ethane as an analogue of liquid water used in Earth-based life forms. It's unlikely, but even if there are no life forms, Titan could turn out to be a great source of organic material for manned space exploration given its low gravity and rich deposits of hydrocarbons. And it would be really interesting to try bioengineering such life forms that could thrive on Titan. The Cassini spacecraft just tweeted about what it sounded like when it arrived at Saturn and passed through the ring plane in 2004. While the spacecraft did not fly through the visible rings, there seems to be enough dust forming an invisible ring where it passed through to pelt the spacecraft with a lot of dust. These must have been truly microscopic dust, since if they were big enough to be visible enough to be seen by the naked eye, they would probably have destroyed the spacecraft at the speeds it was traveling.